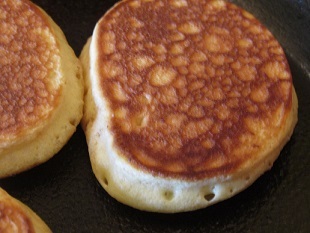 Pancakes, there are so many different variations of pancakes, most counties have their own version and of course being Scottish I have grown up with Scotch Pancakes, delicious fluffy pancakes, ideal as a treat but they were also served up as part of our Sunday breakfast, along with sausages, bacon, eggs etc., like this they soak up some of the delicious pan juices and oh my, my mouth is watering at the moment. Although these days I usually enjoy them with some softened butter and a spoonful of golden syrup, that helps my sweet tooth. So Scotch pancakes, it is your basic store cupboard ingredients, flour, baking powder, bicarbonate of soda, sugar, eggs, milk and butter. I use plain flour, but it is possible to use self-raising flour instead of the flour, baking powder and bicarbonate of soda. This keeps it simple. Also, if you find it difficult to get buttermilk, then use normal milk and add a little white vinegar or lemon juice, this will ‘sour’ the milk and give you the acid that is needed to activate the bicarbonate of soda. This is why you get a nice fluffy pancake, the rise. I know there is a few different views regarding sifting flour or not, for me it depends on the humidity in the air, flour is affected by humidity and it can get a bit lumpy, so I sometimes sift the flour, other times not, use your own judgement. 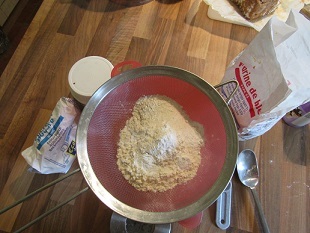 The easy quick way measure and sift your flour, baking powder and bicarbonate of soda together, is, put your sieve over your bowl, place them both on to your scales and then zero your scales, weigh the flour, baking powder and bicarbonate of soda into the sieve and then sieve the dry mixture into your bowl, and voila there you have it, everything sieved together. Then add the caster sugar and mix together so it is well combined. In a jug measure the milk/buttermilk and then add the eggs and melted butter and mix together with a fork to make sure it is all combined. 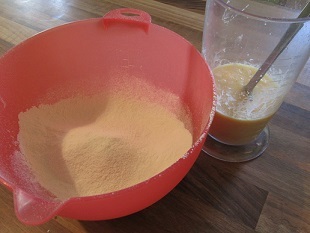 Then with a hand whisk, add the wet ingredients to the dry ingredients, you may not need all of the wet mixture, so add gradually until you have a good thick batter. You need the mixture to stay put when you add it to the frying pan, remember this is not a thin crepe like batter, it needs to puff up so you have lovely fluffy pancakes. 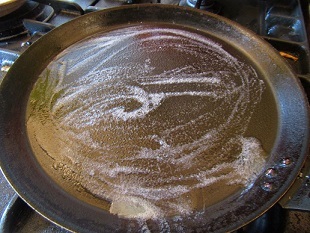 Melt a small amount of butter in a pan and add a good spoonful of batter, to the frying pan, I can usually get 4 or 5 cooked at the same time, just depends on the size I want to make, its entirely up to you. 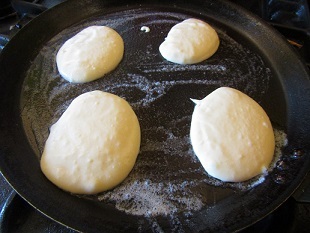 Let your pancakes cook until you see bubbles forming on the top and then flip over, and cook for another couple of minutes until golden brown on the second side and then transfer to a plate. Now it is time to enjoy, depending on how many I am making and for how many people, I find I am usually eating some and continuing to cook the next round. Another one of those treats that there is usually not enough. 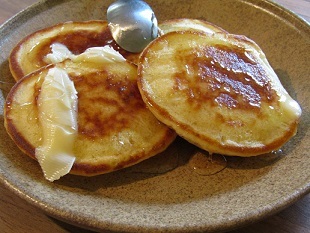 I love to top my pancakes with some softened butter, and then top with a good spoonful of golden syrup, I do use salted butter, so I enjoy the salty butter and the sweet of the syrup…… Delicious. I have decided what I am having for lunch and the pictures here prove that I did. 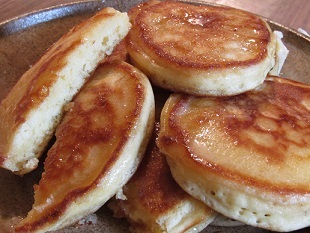 I do hope you enjoy them too, they were a family favourite when I was growing up at home, there was many a night that we would be sitting watching tv and my Dad would disappear off into the kitchen and come out with a feast, and the best wast pancakes. It possible to add dried fruit or chocolate chips to the mixture before cooking, for me I just go with plain pancakes so I can enjoy the sweet topping. 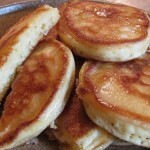 Delicious fluffy scotch pancakes, perfect at any time of the day. Sift the plain flour, baking powder and bicarbonate of soda into a bowl. Measure the milk into a jug and add the eggs and melted butter and using a fork, whisk together to combine. Pour the wet ingredients into the dry ingredients and mix together with a hand whisk until it is all combined and a thick batter. You many not need all of the wet ingredients or you may need a little more, it will depend on the size of your eggs as they can vary considerably. Add a little butter to a frying pan and then spoon some of the batter into the pan, I can usually get 4 or 5 pancakes in each batch and of course it depends on the size of the pancakes. I like my pancakes to be about 10 cm across. 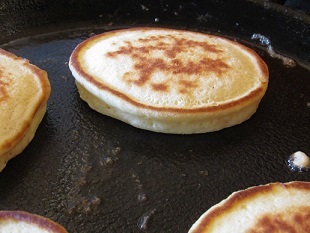 Cook the pancakes on the first side, until you see bubble appearing on the top and then flip them over and cook the second side until golden brown, probably about 2 minutes on each side. 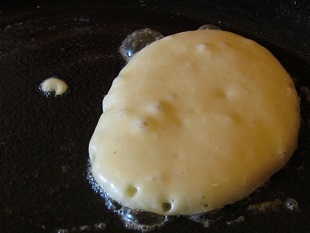 Remove the cooked pancakes to a plate and continue until all the batter is finished. If you cant get butter milk, pour the required amount into a jug and add 1 tsp of lemon juice to the milk and leave for a couple of minutes before using as this will create the same results as butter milk. You can use self-raising flour in place of the plain flour, baking powder and bicarbonate of soda.